Referee: Paul Tierney - second Toon game of the season for the Lancashire-based official, following November's 0-1 home defeat by Bournemouth. TV replays confirmed Rafa's post-match comment that City's penalty award was on the soft side. Attendance: 54,452. United sold their 3,000 ticket allocation, spread across three tiers of seats. This was the largest attendance for a visit of Newcastle at the Etihad, 602 more than were here in October 2015. It was also the largest crowd to see these two teams face each other since 100,00 were present at the League Cup Final at Wembley Stadium in February 1976. The death of Cyrille Regis was marked with a minute's applause before the game began. Predictably, the recent press feeding fest turned the soundtrack from "having a party when Ashley sells the club" back to the old standard, "get out of our club". Press reports that the owner was in attendance were incorrect, but it's a racing certainty that he'll have been aware of the soundtrack. As has been the case in recent visits, the security presence outside the away end was both visible and enthusiastic, with multiple ticket checks, a sniffer dog and thorough searches. Given that some were barely two miles away from the Manchester Arena though, that's hardly a shock. The level of violence inside the ground was surprising though, with a few away followers dragged out following scuffles with home fans, who were close enough for confrontations between the two factions to take place - divided only by a line of police and stewards. PS: From our semi-lofty perch it was also possible to note the amount of time BT pundits Frank Lampard and Rio Ferdinand spent on their phones while the match was in progress. Quality. PS: Can anyone explain why City advertised tickets for their Champions League home tie against Basel on the walls of the toilets in the away end? Do they think we'll be coming back? "We wanted to stay in the game and we did it, the penalty was a bit soft and it changed everything. After we scored we had a couple of chances. They are a very good team, our reaction was quite good. "We changed at the end and played with four at the back, the idea was to stay solid and try to regain and play counter-attack. At the beginning we were giving the ball away easily. To find the balance between defending and attacking is what we were trying to do. "I have been praising the players the whole season in terms of effort, sometimes it's a bit of luck. If you have a little bit of luck you can be ahead in some games." "It's the Premier League and everyone is spending a lot of money - that is why we expect something in this window. Hopefully we can see some new faces before the end of this window. "It’s going to be a very important week for us. We’ve been working very hard to make sure we have the names who can help the team to stay up. "We have the names. We gave a list to the owner - now, it’s just a case of waiting to see if we can do what we have to do. "They know the names. They know what they have to do, and it doesn’t matter if it’s loans or permanent signings, we need the bodies to give the team the ability to manage. "This team was in the Championship and got promoted, and we don’t have much experience of the Premier League. "We need players with quality who can give us something different or experience. We’ll see how many we can get. "I expect someone, but we will see. I don’t know how many we can get. It’s a little bit late now. "When we dropped two points against Crystal Palace, the reaction was amazing. I don't know what is going to happen (at the end of the season) but I don't have to be convinced of the incredible players we have. "When we lost 4-1 against Liverpool, we congratulated Jurgen Klopp and his team and moved forward. The way we fight and the way we try to play when they defend with ten or 11 players in the box is so good. "Mathematically, we need ten victories to be champions and we are going to take things game by game. The players reacted really well with huge personality. We created chances, we scored goals and we conceded few (chances). We avoided two bad results in a row. "It was an outstanding performance, often against 11 players behind the ball (but) we were patient, and we found the space really well. They crossed the halfway just once and scored, but we're so happy. "We reacted really well after dropping points before. It's not how many goals you score, it's how many chances you create, it's how many chances your keeper has to save. It was important how we reacted at 2-1 - we didn't panic. "I said we are not going to buy a striker because we have Sergio and in two or three weeks, we will have Gabriel Jesus. We are so happy for him. He barely touched the ball in the first half and he scored. We need a guy who scores the goals. We are so happy." Since a 1-0 home win in September 2005, Newcastle have failed to beat City in all 21 Premier League meetings: losing 18 and drawing the other three. Sergio Aguero became the first opposing player to net a hat-trick against Newcastle since.... Sergio Aguero, who hit five in our 1-6 loss here in October 2015. The Argentinean has now registered 14 goals against the Magpies in 12 appearances. Wayne Rooney has 15. Aguero also became only the second player to register a two hat tricks against us in the Premier League after a certain Michael Owen. Jacob Murphy's first goal made him the 134th Newcastle player to net for the club in Premier League games. His debut top-flight strike was also the first away goal he's managed since scoring for Norwich City against Newcastle at Gallowgate in September 2016. Murphy's goal was the 12th we've scored on the road in as many games, level with the total we managed away from home in the whole of the 2015/16 season - our lowest-ever PL total. This was game number 177 against City, leaving them just two behind our most faced opponents in league and cup, Arsenal. Also up there are Liverpool (172), Everton (169), Aston Villa (163) and Manchester United (162). Murphy's goal against the PL leaders was our 253rd against City, taking them level with Aston Villa as the team we've netted against most often. Next up are Everton (247), Arsenal (240) and Manchester United (232). Only three teams have found the back of our net more times than the 262 hit by the Citizens; Manchester United (314), Liverpool (298) and Arsenal (265). Close behind are Everton (254) and Spurs (251). 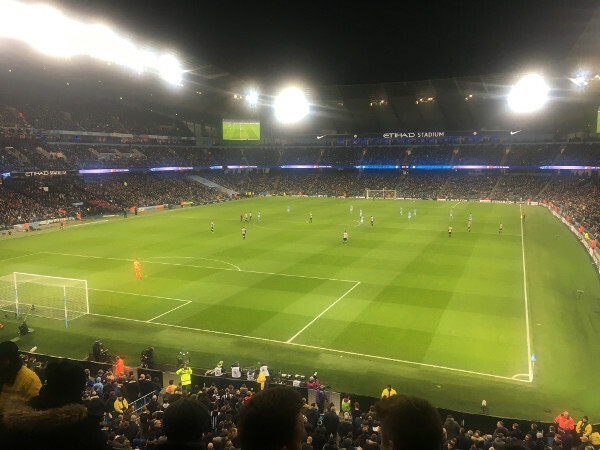 Although resisting the temptation to repost the match report from the last meeting 25 days earlier, it's fair to say that we didn't exactly have a spring in our step walking up the road to the Etihad Stadium for this Saturday teatime kickoff. An unbeaten four game run since that single goal defeat at Gallowgate was always going to be tested beyond breaking point by a side with a rare free week in which to recover from their first defeat in 31 Premier League games. Having gone through the whole of 2017 without losing on home soil, Pep Guardiola's side were the strongest of favourites to record their eleventh league victory here in 12 attempts this season. What would have been Newcastle's third successive away win was rated at 22/1 by the bookies, while managing a clean sheet and snatching a 1-0 win weighed in at a colossal 50/1. 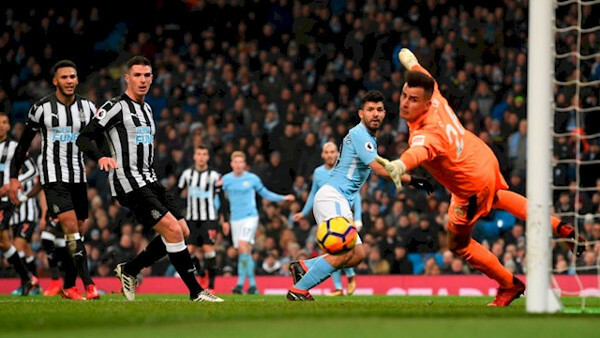 In the event though we held out for only three minutes longer this time round before Karl Darlow picked the ball out of his net and Sergio Aguero wheeled away to celebrate a goal that multiple replays on the stadium screens failed to confirm that he'd actually scored. It remained at 1-0 for almost another 30 minutes of play, Darlow preventing both Sterling and Kevin De Bruyne from netting despite City monopolising play (82%/18% was beamed across the stadium advertising screens, United in danger of spending less time in possession than the ballboys - who actually know what they're doing here, unlike the sponsors bairns that we routinely indulge). The apparently decisive second goal failed to appear though until a debatable penalty decision gave Aguero ample opportunity to double his tally - Ayoze Perez stripped and ready to come on before referee Paul Tierney penalised Manquillo for making contact with Sterling. With nothing to lose except goal difference, Newcastle then promptly got on the scoresheet themselves as Jacob Murphy showed pace and composure to score a goal to hopefully boost his confidence and standing going forward - and threaten to make a game of it here. For quarter of an hour the roars coming from the away section were of encouragement rather than defiance, as the visitors enjoyed their best spell of the game and Darlow brought off another great fingertip block to deny De Bruyne. Mo Diame came close to an unthinkable equaliser when his shot and follow-up were both blocked by Ederson, with Perez having another effort blocked by a defender in between. Hopefully that brief exchange did enough to register on the statistical scale and spare us from another week of ridicule for not being willing lambs to a City slaughter and ruining this televisual feast. Dwight Gayle was brought on but by the time his golden chance to score came, Sergio Aguero had added to his incredible scoring record against United with a "perfect" hat-trick, adding a left footed shot to his header and right footer after some dazzling trickery from Leroy Sane. Rather more away fans that witnessed the closing stages of our last game here remained to applaud their side at full time; defeated but certainly not disgraced and having avoided significant damage to what could be the vital factor of goal difference. Results elsewhere were rather more positive than the previous weekend, meaning that we held on to fifteenth, three points off the top half and a single point above the relegation places. It remains incredibly tight down there with ten teams facing the genuine threat of demotion. As far as we're aware though, none of those rivals have takeovers or bullying allegations clogging up their in-tray as they try to conclude their deals. And while some have been engaged in managerial negotiations, they've been of the hiring and firing variety, rather than thrashing out new deals. Putting Sunday's FA Cup interlude aside, we return to Premier League action against Burnley on the final day of January, which is also transfer deadline day. By then we may have a greater level of visibility - but it remains to be seen whether the view is any more enjoyable.